Creativity often comes like a thief in the night. It breaks into your mind when you’re not expecting it. The story I’m about to share came about from that kind of invasion. As I was enjoying one of my other creative past times, woodworking, ideas began landing on the shores of my other passion: storytelling. How Things Turn Out is very short, and I hope you enjoy it. Please give me your honest feedback on how I could make the story better or improve my writing skills. Sawdust caked the woodworker’s hands as the wood spun against the chisel. Streams of it left the blade, littering the workbench. Aromas of the fresh Bethlehem Olive wood filled the air. The man’s daughter would be graduating from nursing school next week, and he wanted to surprise her with a special gift–a wooden ballpoint pen. It wasn’t much, but it came from his hands and that always meant something to her. He stopped the lathe to check his progress. The former rectangular-shaped wood blank had become round and cylindrical. It didn’t resemble a writing pen just yet, but many new features had emerged. This excited the woodworker as each piece was unique–its smell, the grain pattern, the texture, and the color. He had to be careful while the future pen took shape. Don’t take too much wood off. Monitor the lathe’s speed. Switch to the sandpaper for the finishing touches. He slid the chisel along the spinning blank, removing more layers and bringing out the pleasing curves. Without any warning, the chisel jolted and a big piece of wood flew off. The man turned the lathe off to inspect the damage. A large chunk had broken off, completely ruining the blank. The tool had hit a weak spot in the wood. Not the kind of thing anyone can predict. “Darn,” said the man. A setback, yes, but not the end of the world. He stared at the blank and then drifted into a daze. A mental image of the crumpled-up car formed in his mind. The twisted metal, the accordion-shaped hood, the shattered windshield, and the blood-splattered upholstery. How many times had he told Will not to hang out with that group of potheads? He looked to the shop floor and tried to clear his mind. His eyes began to blink. As he’d done many times before, the man replaced the damaged blank with a new one, and went to work cutting away the unneeded wood. The noise of the chisel against the wood imitated the sound of the car engine. Together, he and Will had restored the old mustang and brought it back to life. Like a merciless army, the memories were overtaking him now. The wood, the chisel, even the lathe began to blur behind the tears. Will had turned 18 a week before the crash. He had wished that he might attend two graduations–Will from high school, and Will’s sister from college. The college girl, Sarah, wanted to be a nurse. It had been so easy to talk to Sarah. She always knew what she wanted and where she was going. Will remained one big mystery. He turned the lathe off and ran his finger back and forth along both blanks, feeling for defects–pits, holes or major cracks. Now he must switch to the finishing steps. He pulled out the strips of sandpaper and shaved away microscopic portions of wood. It began to look more like a pen. The man repositioned the bright shop light and slowly twirled the transformed olive wood. He searched for tiny scratches and other imperfections. The grain had begun to show its exquisite pattern, and the wood’s smooth surface shone under the light. This one must be perfect, he thought to himself. The man looked up and out through the window to the backyard. This was the yard where he had taught his son how to throw and catch a baseball. Here his daughter had made her maiden voyage on her bicycle with no training wheels. Just a year ago, they had sold the bike in a yard sale. To his wife’s dismay, He had changed his mind about selling the the wood lathe to the next door neighbor. Sue Ellen never understood his passion for woodworking. It was now one of the few pleasures that kept him going. The man carefully aligned the pen parts and pressed them together. He then tuned and tested it by drawing a cross, a circle and then a heart; it worked just fine. He smiled and began to imagine the future events that pen would live through: wedding invitations, thank-you notes, letters of apology, Christmas cards, tax returns, permission slips, contracts, legal forms. He walked back into the house and headed toward the kitchen counter. He passed by Sue Ellen as she stared blankly at the living room wall. It was a good day; she remembered who he was that day. The man ran his fingers through his wife’s hair, kissed her on the forehead, and made sure her water glass was full. The commitment papers rested openly on the countertop. He’d almost forgotten to sign them. About five years had passed since the accident. Sue Ellen had made little progress, forgetting where she was half the time, not taking her medication, and once attempting suicide. The man feared that things had gone beyond his ability to manage or cope. He looked over the forms one more time and sighed deeply. The new pen hovered just above the signature line. Something stopped him. He thought about his work: the beauty of the pen’s shape and color, the invested time, the mistakes, the setbacks, the tediousness of it all. But also the pleasure of it all. Then it dawned on him that the beauty of the pen was there all along. He had just released it from a tomb of bark and unwanted layers. “No, not today,” he said. “Not today.” Hope was still there–somewhere beneath the surface of his doubts. The man slid the forms into a nearby filing cabinet. 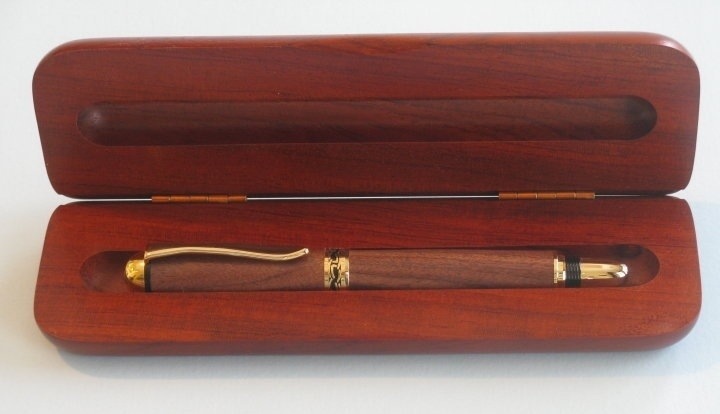 He then placed the pen inside a rosewood presentation box and stuck a red bow on it. Over the next few months, I’m hoping to submit some of my short stories to writing contests or literary magazines. So I would cherish any feedback on how I can make these stories better. Feel free to use the contact link above or leave a comment. This entry was posted in Outdoor Writing and tagged creative writing, creativity, fiction, grace, grief, hope, love, short story, storytelling, writing. Bookmark the permalink. Scott, I enjoyed the story. It made me think of my dad as a lone empty nester since Mom passed away last year. I think I’ll make my visit with him today last a bit longer. Thanks, Henry! I appreciate you sharing that about your dad. The older I get, the more I realize my elders have a lot more to offer and a lot more value than I give them credit for. Also, with those who seem to be depressed or facing a lost in their life, we should never give up hope. Thanks, Mim! I’m glad you enjoyed it.